Further Education is central to rebuilding and rebalancing the economy. 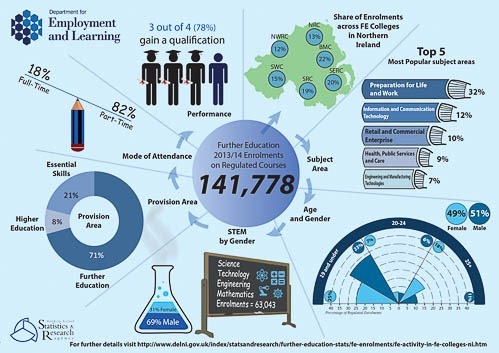 The Further Education (FE) sector, and its contribution to economic development and growth through the provision of high quality education and training, is central to rebuilding and rebalancing the Northern Ireland economy. The sector continues to operate at the heart of economic recovery and it has consistently demonstrated its ability to meet the changing demands of industry. The sector has been at the forefront of supporting economic growth and recovery. The agility of the sector is demonstrated through, for example, new academies (e.g. Welding Academy, Cloud Academy) and the introduction of new apprenticeships in non-traditional sectors (e.g. pharmaceutical, life sciences, ICT and finance/accountancy). The FE sector offers a broad and diverse curriculum, an orientation towards meeting local and regional skills needs, coupled with close links with employers and supporting local business and industry through knowledge transfer activity and bespoke training. Economic recovery is predicated on having the infrastructure and skills to allow businesses to develop and flourish. The FE Colleges work alongside industry, from the biggest employers through to the smallest of local businesses, in matching College curriculum and designing bespoke training solutions to the needs of industry. The Colleges play a significant role supporting a wide number of companies – for example, Norbrook, Caterpillar, Bombardier, Harland & Wolff, Seagate, Moy Park, Concentrix, Almac, Kingspan, Michelin, Deloitte and PwC. The Colleges support business and industry through a range of funded initiatives from the Employer Support Programme (InnovateUs), Customised Training, Innovation Vouchers, Assured Skills and the FE/HE Connected programmes as well as bespoke training, mentoring and research offered by individual Colleges. For example, InnovateUs provides opportunities for small businesses to acquire the skills to engage in these innovation activities, enabling them to develop new products, new services and new ways of working. 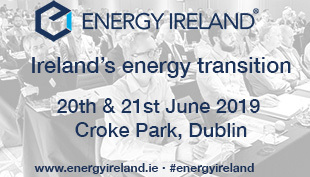 These projects have covered areas such as ICT, renewable technologies, engineering and creative and digital media, delivering tangible impacts to businesses including cost savings, increased sales and access to new markets. Therefore, by providing both skills support and innovative solutions for business products and processes, Colleges are bringing their considerable resources to bear in meeting the challenge of building an innovative economy. This capability is further underpinned by considerable investment in facilities and estate over the past 10 years which has provided the platform for Colleges to assume this strong economic role. 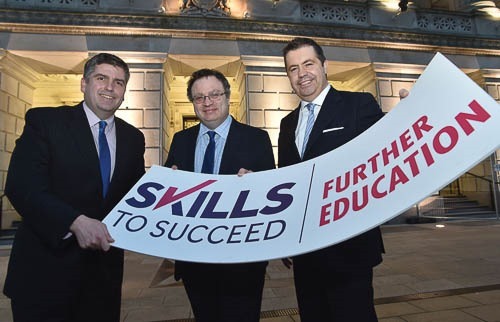 The contribution of the FE sector is highly significant in terms of fulfilling both the principles and the priorities of the Programme for Government and other high level economic strategies. The Colleges have developed into economic and innovation powerhouses over the past decade and have worked very closely with government to deliver on the economic priorities, both at a regional and at a sub-regional level. In addition to the Programme for Government, this includes the Economic Strategy, the Innovation Strategy, Building a United Community and A Shared Future. The common themes across all government policy are ones of growing the economy, creating a fairer society and building peaceful communities. The FE Colleges continue to make positive contributions to each of these areas. The devolution of corporation tax will make it more attractive for additional foreign direct investment (FDI) to locate in Northern Ireland. The FE sector is a key enabler in supporting skills and the change in corporation tax will attract business investment from both indigenous and foreign direct investors creating vital job opportunities for our young people. Much has been highlighted in terms of the advantages that a lower corporation tax regime will bring by way of FDI. However, the key factor in all of this is the availability of skilled labour. Across the six regional FE Colleges there are close to 100,000 individual students. The main characteristics of the student population are explained in (Table 1). The College Open days taking place during January-March 2015 and potential students will have the opportunity to explore courses on offer (Table 2). 9 out of every 10 students complete their course and gain a qualification. 44% of learners are from the most deprived areas of Northern Ireland. 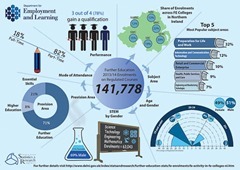 ï»¿1 in every 5 Higher Education students in Northern Ireland study at one of the 6 FE Colleges. Furthermore 1 in 3 HE students are from the most deprived areas in Northern Ireland. ï»¿44% of students are studying a STEM related subject.